A lavish award-winning bicolor from the late 1940s, Wirosa has double flowers of a deep rose pink edged in ivory. The interiors are marble white with raspberry brush strokes. May blooms measure up to 4 inches across and are carried on strong 14-inch stems. 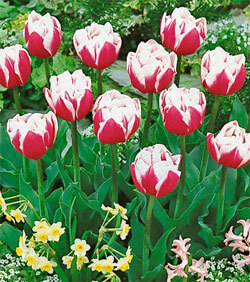 It only takes a few Wirosa tulips to make a show stopping garden display, and be sure to plant enough for bouquets.